The best way to protect your baby's eyes is through regular professional examinations. Certain infectious, congenital, or hereditary eye diseases may be present at birth or develop shortly thereafter. Yet, when diagnosed early, their impact may be greatly minimised. So have your baby's eyes examined by an optometrist before six months of age (or sooner if recommended by your Health Care Professional) and regularly throughout their life. Chances are your optometrist will examine your baby’s eyes in one of your first few visits. They will review your baby's health and family health history. Be sure to tell them about any eye health issues in your family, as many of these can be inherited. How Will the Optometrist Test My Baby's Eyesight? Ability to fixate Your optometrist will move an object in front of your baby’s eyes to see if the eyes can watch and follow the object. Coordination of eye muscles The optometrist will move a light or some interesting toys in a set pattern to test your baby's ability to see sharply and clearly at near and far distances. Pupil response to light The optometrist will shine a small light (a penlight, for example) in your baby's eye and watch the pupil's reaction. The pupil normally would get smaller very quickly in response to light. Eyelid health and function They will examine each eyelid to be sure it is functioning normally. This includes a check for drooping eyelid, inflammation, and any other indications that your baby’s eyes need greater attention. If anything is out of the ordinary, you’ll be advised to make an appointment with an ophthalmologist who will perform a more comprehensive evaluation of your baby’s eyes. What Does a Comprehensive Eye Exam Involve? Babies should have their first comprehensive eye exam by an eye care professional at six months. They will perform additional tests that the paediatrician does not. This is essential if there are any major vision issues that run in your family, as they may have been inherited. Vision correction They will use eye drops to help your baby’s pupils dilate, creating a better window to the back of your baby’s eyes. This dilation allows your doctor to check for Shortsightedness (myopia), Longsightedness (hyperopia) and Astigmatism. The drops take about 45 minutes to work, and will blur your baby’s vision and cause a little light sensitivity for a few hours. Using a retinoscope, the doctor will move the light to see it reflected in the pupil. The shape of the reflection helps the doctor determine if your baby has vision issues that require correction. The interior and back of the eye After dilating your baby's eyes and dimming the lights, the doctor will use a special instrument called an ophthalmoscope to see through to the retina and optic nerve at the back of the eye. This is where clues to many eye diseases first show up. 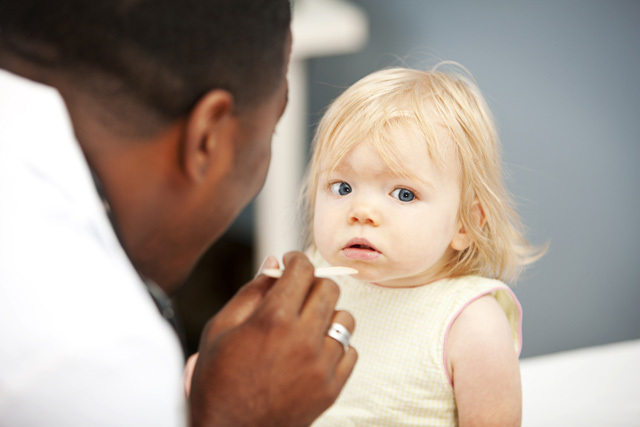 Tests for a specific issue Be sure to discuss any other concerns you have about your baby’s eyes such as crossed eyes and nystagmus, so your doctor can do the appropriate tests and advise you on the action required. B+L Early Vision Institute and Lions Clubs International have partnered to form the Pediatric Cataract Initiative.